Now, I may be getting a bit ahead of myself, but I’m assuming that you have already started the game and successfully named your characters. If you haven’t, then you may need to use a different guide… I will be using the default names when referring to each character throughout the game, so my apologies if you decided to name Firion “Charlie” and the names don’t line up. After a cinematic that sets the stage for the game, we are immediately thrust into a battle. Nowadays, the first-battle-that-you-are-destined-to-lose may be a bit cliched, but it was groundbreaking at the time. Have everyone perform whatever action you desire and let them be cut down with alarming speed. Rather than dying, and setting the record for fastest Final Fantasy game completion, we are instead introduced to two new characters: Princess Hilda and Minwu. 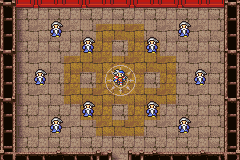 After you gain control of Firion, exit into the hallway to meet Maria and her brother Guy. It doesn’t seem like Leon made it… After “introductions” are made, proceed to the throne room where Princess Hilda will tell our group that we have no business fighting. Learn the phrase Wild Rose, then ask Hilda about it to gain more insight into the current conflict and learn about the town of Fynn. This is why I like Princess Hilda: She doesn’t pull her punches. Died in your first battle? How about you stay in the city with the rest of the children! 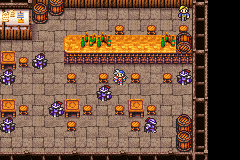 Unique to Final Fantasy II is a conversation system whereby you learn keywords and can ask them to certain NPCs. This system gives players a bit of agency when it comes to the flow of conversation. Throughout the game, you will be required to learn and repeat many keywords to many people. In this guide, all keywords, such as Wild Rose, will be marked thusly, so they stand out from the rest of my ramblings. Be sure to grab the potion from the western side of the hideout and exit into the town of Altair. Head to the magic shop and use your starting funds to purchase two Cure Tomes. You can give these to whomever you choose; I usually pick Firion and Maria for role-playing reasons as Guy seems a bit… Let’s say that if Final Fantasy II used the D&D ruleset, Guy would have an intelligence lower than 10, if you get my meaning. Once you have the Cure Tomes, it’s time for a bit of grinding (which I promise to keep to a minimum). Your goal is to get enough Gil to purchase six spells: Fire x2, Thunder x2, and Blizzard x2. 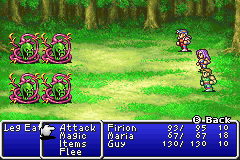 Elemental affinities play a more significant role in Final Fantasy II than they did in Final Fantasy I, so it’s essential to have all options available to us. You can save up for additional weapons, bucklers, and armor if you choose. If you are new to the game, take a moment to return to the sigil room (the room you woke up in) and speak with the people there for several brief tutorials. 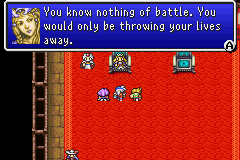 The level system in Final Fantasy II is a bit different than any of the other games in the series: There is no experience and you instead level individual abilities based on how often you use them. There are several ways to abuse this system to make your party overpowered, but I feel this takes most of the fun and challenge out of things, and is not something I recommend for a first playthrough. 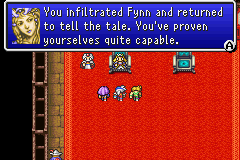 Final Fantasy II is very open-ended with character development. You can put everyone in the back row with a Bow, or put everyone in the front row dual wielding Broadswords. I like to specialize each character with 1 or 2 different types of weapons, making sure to keep any overlap to a minimum. This way when you start collecting powerful weapons you’re more likely to have someone in your party proficient with it. My personal preference is to have characters use a melee weapon in their right hand and a shield in their left. This setup has the lowest attack power but offers substantial evasion/agility boosts, which improves survivability. Later in the game, some weapons offer evasion bonuses, and you can transition into dual wielding when the time comes. Leg Eater? More like Ankle Biter, am I right? After you have purchased everything you want from Altair, proceed north across the bridge. You will soon come across the town of Gatrea, but you should not enter it at this time. Continue west past Gatrea, circle around a lake, and head back east. You will see Fynn just ahead. Remember that the empire has captured Fynn, and as such, you should not talk with any of the soldiers wandering around the city unless you want a repeat of the opening battle. All the shops are empty except for the Pub, which is where you should head next. The path is far from direct, and there are random encounters within the city, so watch your step. The Pub is full of Imperial captains that you should also avoid. You need to speak with the bartender and drop the word Wild Rose into the conversation. He will reveal a secret passage that leads to a room with three treasure chests (all containing potions) and a dying man. If you say Wild Rose to the man, he will give you a Ring, a sob story, and then pass into eternity. This ring, along with being a plot item, also allows you to view the World Map using the ever popular “Tceles B Husp” method introduced in Final Fantasy I. Exit Fynn and return to Princess Hilda in Altair. When you enter the throne room, tell Hilda about the Ring. She will decide that you maybe aren’t as useless as she initially thought, and will let you join the rebellion. Hilda will then tell you about Mythril. Speak with Minwu next, and he (she?) will join your party and grant you access to the mighty Canoe. Come full circle and speak with Hilda yet again and learn the word Dreadnought. Make like a drunken parrot and repeat this phrase back to Hilda to learn the keyword Airship, then leave Altair. It’s time to track down Josef!